Andy Warhol was really a creative genius. 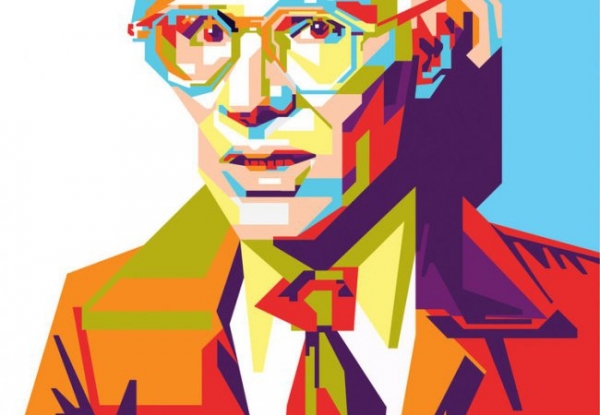 Wikipeda says; Andy Warhol (/ˈwɔrhɒl/; born Andrew Warhola; August 6, 1928 – February 22, 1987) was an American artist who was a leading figure in the visual art movement known as pop art. His works explore the relationship between artistic expression, celebrity culture, and advertisement that flourished by the 1960s. After a successful career as a commercial illustrator, Warhol became a renowned and sometimes controversial artist. The Andy Warhol Museum in his native city, Pittsburgh, Pennsylvania, holds an extensive permanent collection of art and archives. It is the largest museum in the United States dedicated to a single artist. Warhol's art used many types of media, including hand drawing, painting, printmaking, photography, silk screening, sculpture, film, and music. He was also a pioneer in computer-generated art using Amiga computers that were introduced in 1984, two years before his death. He founded Interview Magazine and was the author of numerous books, including The Philosophy of Andy Warhol and Popism: The Warhol Sixties. He managed and produced The Velvet Underground, a rock band which had a strong influence on the evolution of punk rock music. He is also notable as a gay man who lived openly as such before the gay liberation movement. His studio, The Factory, was a well known gathering place that brought together distinguished intellectuals, drag queens, playwrights, Bohemian street people, Hollywood celebrities, and wealthy patrons. Warhol has been the subject of numerous retrospective exhibitions, books, and feature and documentary films. He coined the widely used expression "15 minutes of fame". Many of his creations are very collectible and highly valuable. The highest price ever paid for a Warhol painting is US$105 million for a 1963 canvas titled "Silver Car Crash (Double Disaster)". A 2009 article in The Economist described Warhol as the "bellwether of the art market". Warhol's works include some of the most expensive paintings ever sold.